EXIT 57 STUDIO - CLASSIC PORTRAITURE WITH A MODERN TWIST. CAPTURING BIG PERSONALITIES IN THE SIMPLICITY OF A SILHOUETTE Exit 57 Studio is proud to offer The Shadow Series: A Modern Approach to Classic Portraiture. Taking a clue from the art of a traditional silhouette, we put a contemporary twist on the process to create a shadow portrait. By capturing such big personalities with such simplicity, the result is not just a photo, but a unique piece of art to be treasured and displayed. Shadow Series Portraits start at 99. 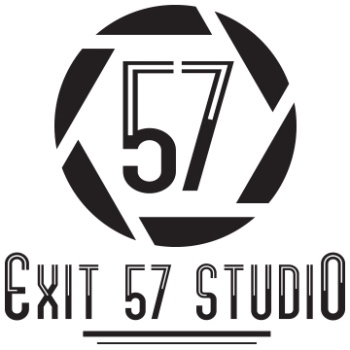 Exit 57 Studio Photography, we believe that senior photos are a rite of passage for all high school students. These images will be shared with friends, classmates and family members. Because these photos are so special, we strive to make your experience unforgettable. Every senior client receives a custom session geared to his or her personality and interests. From your clothing, to your props, to your hair and makeup, we have you covered. We offer several portrait packages, one is sure to be what you are looking for. We even provide items a la carte, so you can be confident you will get all the photos you need. PRINTING PHOTOS OF YOUR CHILDREN AND HANGING THEM IN YOUR HOME OR OFFICE HELPS TO BOOST THEIR SELF ESTEEM. IS YOUR PET PART OF THE FAMILY? WE BELIEVE THEY ARE, SO WE OFFER PET PORTRAITS...WITH PERSONALITY. The Shadow Series Portraits are not just photos, but unique pieces of art. Is your professional photo a selfie? Or maybe it's more than 5 years old? It's time for an upgrade! Your headshot is your first impression. Make it memorable. YOU are your brand, be sure your photo represents you well. in our studio, or at your location. If you could build your child's self esteem with photographs, would you? In today's society children of all ages are bombarded with images of who they should be, how they should act and what they should look like. Studies show that the simple act of displaying photo of your children and family in your home and office can help build your child's self esteem. Our Prints Have Power session are designed to produce gorgeous photos of your children that you will be proud to use to decorate your home. Here at Exit 57 Studio Photography, we believe that senior photos are a rite of passage for all high school students. These images will be shared with friends, classmates and family members. Because these photos are so special, we strive to make your experience unforgettable. Every senior client receives a custom session geared to his or her personality and interests. From your clothing, to your props, to your hair and makeup, we have you covered. We offer several portrait packages, one is sure to be what you are looking for. We even provide items a la carte, so you can be confident you will get all the photos you need. “My bias is very simple. I think family photographs should be on the wall." My name is Karen Hudson and I am the owner/photographer at Exit 57 Studio. I am a former science geek, who would be happy to entertain you with fabulous stories about my molecular genetics PhD thesis and research, but would really much prefer to listen to you tell me all about your wonderful family or pet. I stopped working in a lab about 15 years ago to pursue my photography passion. I love the way the back end of a dog wiggles almost uncontrollably when they are overcome with happiness. I think taking pictures is just about the most fun anyone can have. I thank my mom for instilling in me a love of both photography and pets. And always supporting my pursuit to bring them together. I like to watch old time horror movies especially the vampire ones. I once pushed a car out of a snowbank all by myself in the middle of a blizzard. I still think 80s hair metal is totally awesome (I know, that's embarrassing, but true). I want my kids to have great memories of their childhood, just like I do. I feel compelled to live up to my dad's example of work ethic. I just learned how to ride a motorcycle and passed the CA DMV test to make it official. I will play the tambourine in the band my brother has promised to form when he wins the lottery, but he better hurry up because I am getting way too old for the proper tambourine girl outfit. I can get emotional listening to song lyrics. I treat my pets like they are part of my family, because they are. I confess that I own way too many pairs of shoes. I might just need an intervention. I am honored to have 2 sons who make me proud everyday. I have great friends who are always there for me...both the two legged and four legged variety. I always tell my new clients, 'no matter what your dog/cat does, or how they behave, don't worry, I've seen worse' and I have! I vow to make your photo session fun for you and/or your pet. I promise you will love your photos almost as much as I loved taking them.